Our Master Tiler hard at work applying the all important waterproofing. River Rock feels fabulous on the feet. Hansgrohe Rain Shower with Hand-Held Spray. One of our favorites. Frameless rolling bypass door provides the finishing touch. Installed by Falmouth Glass. Complete makeover of this kitchen fit this post and beam house perfectly! We were able to fit a wall oven, microwave and a full-size refrigerator in this small yet efficent kitchen. Stunning quartz countertops provided the perfect finishing touch! Here is a progress picture showing the glass and rock tile that was a perfectly selected backdrop. A long time client from Sandwich MA who loves our work, asked if we could build her a new sunroom even though it was not our typical project. Supported by Diamond Piers which eliminated the need for a foundation, we built this structure into the back of the house. It is a fully insulated 3 season room. All of the trim and bead board on the interior is white pvc that doesn't need to be painted. The flooring is Azek T&G planking that adds to the porch feel. The awning roof was built and installed by Cape Cod Retractable Screens and Shutters of Bourne. Entire structure is brand new. Roof overhang is standing seam metal roofing. Homeowners Cat loves to hang out here. Step down to the putting green/ping pong table. Just wrapped up this kitchen remodel in West Dennis. Clients are absolutely thrilled with the end results! All new kitchen ready for the summer! Quartz countertops and our signature Cape Cod Thank You gift for our clients. 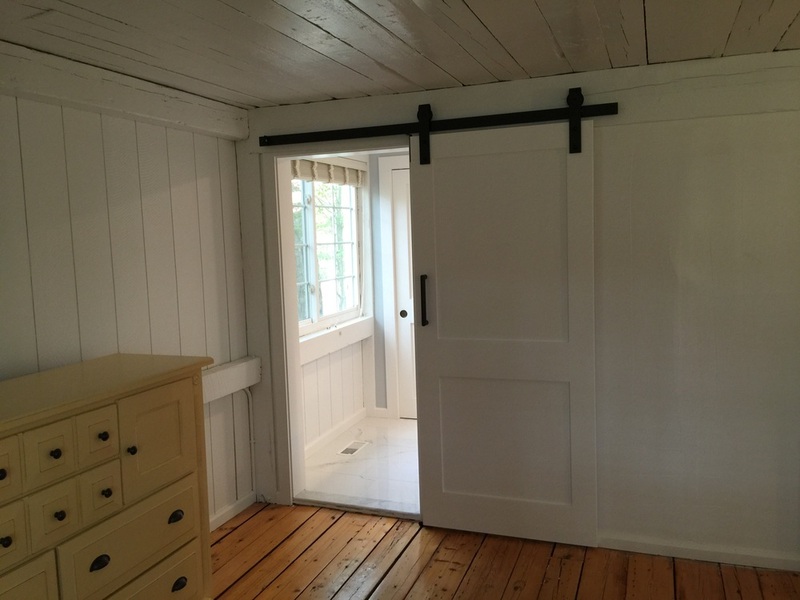 Rolling barn style doors. All new pre-finished flooring. New opening between main part of house and kitchen/sunroom. Progress pic of a custom window seat (now ready for painting) we built as part of a Mashpee kitchen remodel. These cabinets fit perfectly in this large space. More to come is the counter and the custom bead board cap. Still to be decided is the hardware for the cabinet doors and drawers. This photo below shows the 8' high, 8' wide run of cabinets that will serve as a pantry in this kitchen. We had the cabinets modified to a 15" depth. Existing bath was gutted to the studs. New recessed vent fan installed. Acrylic shower surround by Sterling Plumbing. Delta Shower System with detachable hand-held spray. Frameless swing shower door installed by Falmouth Glass. New Strasser Woodwoodern Works vanity. One piece Swanstone vanity top. Existing door to the bathroom was replaced with a glass pocket door. TOTO Dual Flush Toilet and plank tile complete this remodel. 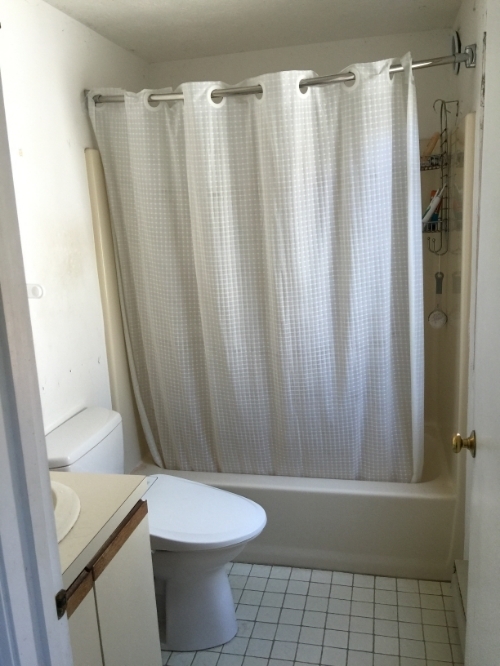 Follow along as we transform this dated and dingy bathroom located in Mashpee into a show stopper! This is a typical bathroom in a house built in the 80's. It didn't take too long to demo out this bathroom! The black stains on the floor indicate where water had leaked over the years. Bathroom is 5' wide by about 8' long. Typical of most Cape Cod Bathrooms we remodel. In the this picture, Master Craftsman Mike is installing the round window trim he custom made in his shop. He cut such perfect circles, that the trim rolls smoothly across the floor. Pretty Impressive! Mike cut the circle trim out using a template and a router. He then sanded the edges prior to installing the trim which is now ready for priming and painting. I actually found these windows online from another builder who was selling them as the project architect decided that they were not big enough for the house that they were going to be installed in. Adam is doing some prep work here prior to covering the in-floor heat shown here under the green mesh. Our Tile Extraordinaire Adam Aronson! As you can see in the picture below, lots of progress!